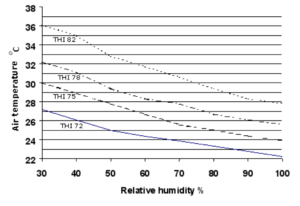 Heat load in dairy cows is a combination of temperature and humidity, and is termed the temperature humidity index (THI). The higher the humidity, the lower the temperature required to obtain a given THI. Cows start to get into trouble when the THI increases above 75. For example, at 50% relative humidity, the temperature required to give a THI of 75, 78 and 82 is 28, 30 and 33 respectively. At an 80% relative humidity, the temperatures required are 25, 27 and 29. 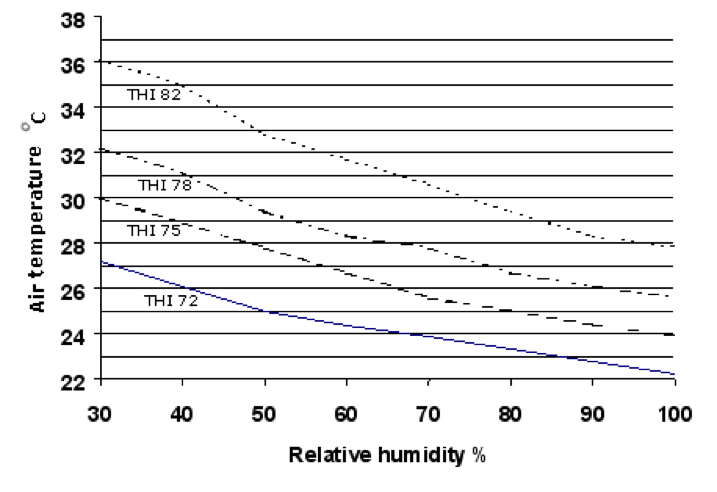 Figure 1 shows the relationship between temperature, humidity and THI. A THI of 75 will start to reduce conception rates in dairy cows; a THI of 78 will result in reduced milk production, while a THI of 82 results in big drops in milk production. Higher producing cows produce more metabolic heat and have less heat tolerance. Much of the information in this article has been obtained from the DRDC (Dairy Australia) publication “Managing hot cows in Australia”. In addition to this excellent booklet, the NSW DPI has information available on its website.